On September 11, 2006 GENEVA’s Hilton Palace Hotel was the venue for the main event of this twelve-city World Peace Tour in Switzerland and for the visit of Dr. Hyun Jin Moon. The UPF staff in unity across the generations had postered, leafleted and invited people throughout the city in preparation for the event. The program was opened by a soprano soloist and accompanying pianist from Geneva’s Conservatory. The Secretary General of UPF-Switzerland, Mr. Heiner Handschin, reflected on the contrast between the hope embodied in the constructive and sacrificial engagement of three generations of the Moon family for world peace and this fifth anniversary of the September 11 tragedy. At a time when the immediate and collateral damage of family breakdown seems unstoppable, this powerful family testimony moved many participants to tears. The Chairman’s Address was read by Dr. Joong Hyun Pak, introducing the profound heart and passion of Father and Mother Moon in their decision to make three arduous, consecutive world tours proclaiming (and demonstrating) the components of sustainable peace. Dr. Hyun Jin Moon came to the stage to read his father’s Founder’s Address with a dynamism and sincerity that indicated his having long taken up the cause as his own. The attentive audience composed of Ambassadors for Peace, colleagues from our UN/Geneva activities, friends, members and relatives interrupted on several occasions with their applause. Earlier, in the introductory segment of the program, a Counselor from the Jordanian Mission to the United Nations, speaking for Ambassador H.E. Moussa Burayzat, praised the work of UPF and Women’s Federation for World Peace International (WFWPI), which he had experienced personally in the Middle East and Jordan. Ms. Conchita Poncini, WFWPI Ambassador for Peace, Chairperson of a United Nations CONGO Working Group on “Women and Economic Development” and former President of United Nations NGO Committee on the Status of Women, underlined the components of women and family in building a Culture of Peace. The entire program concluded with the World Peace Blessing, the appointment of Ambassadors for Peace and a song by Ms. Julia Handschin dedicated to all those working for world peace. The Universal Peace Federation’s Festival for Peace had the privilege to welcome Mrs. Jun Sook Moon at the Hotel Glockenhof in ZURICH. After an opening musical performance and a general explanation of the history and aims of UPF, the MC gave a short biography of our main speaker highlighting her work alongside her husband, Dr. Hyun Jun Moon, in guiding youth to become the leaders of the future. Mrs. Moon entered to great applause and delivered the speech with great clarity and confidence. Her graceful presence brought a spirit of peace to the room and all the guests, including 12 Ambassadors for Peace, attentively followed in English or German. Supportive applause was given many times throughout the speech, and many stood clapping at the end. Seven new Ambassadors for Peace were recognized and awarded certificates. They commented positively on the evening and complimented Mrs. Moon on her eloquent delivery of the speech. From this international gathering of our families and guests we could feel that many barriers were being eliminated through our efforts for world peace. BASEL is a truly international city straddling the border between Switzerland, Germany and France. 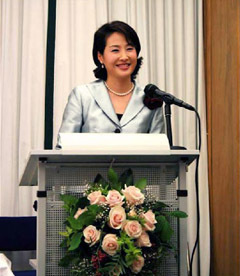 The Hilton Hotel provided the venue for Mrs. Ji Yea Moon to represent the Federation’s Founders Father and Mother Moon on their three-generation World Peace Tour. The local UPF community had made enormous efforts to reach out to the city, from leafleting shops and homes to emailing Members of Parliament. On the evening they appointed two Ambassadors for Peace. Mrs. Moon was as elegant and gracious as ever and impressed the Basel audience with the Founder’s peace message. It was a time to redetermine to continue in the spirit of outreach which the Moon family brought to Basel. BIEL/BIENNE is situated on a language boundary such that even the name of the city is written in both French and German. We projected a PowerPoint presentation of the whole program on a big screen so that all could read in their own language. Our principal speaker was Mr. In Sup Pak, who read his father-in-law’s Founder’s Address marvelously. This event was indeed a living testimony to the power of family solidarity as Mr. Pak was supported by his mother, the wife of the Regional Director for UPF’s newly-formed region in Europe. In fact the whole occasion was prepared by the combined effort of a few loyal families dedicated to the work of UPF in Biel/Bienne. The evening concluded with Lama Rigdzin and one of his followers being appointed as Ambassadors for Peace. LUGANO is situated in the Italian-speaking part of Switzerland. Our local UPF chapter was grateful for the support of UPF members from Varese, Italy. The hotel, situated directly on Lake Lugano, provided a comfortable setting with beautiful views. Our program started at 19.30, and the atmosphere was calm and familiar. Even the children were respectful and quiet. As the Founder’s Address was read by Mr. Hyung Jin Lee, the audience was interested and attentive. It was inspiring to observe directly this practice of Father Moon’s philosophy of peace, as his family members from three generations travel the world promoting the Federation’s strategy for peace. Mr. Mauro Sarasso from UPF-Varese proved to be a very effective MC, guiding us well through the packed program, which concluded with the appointment of five new Ambassadors for Peace and time spent in informal sharing. Ms. Shin Sook Moon, granddaughter of UPF’s Founder, was welcomed at Zurich airport with information about the town of BUCHS and nearby Liechtenstein. This included a picture of her grandfather establishing a holy ground for peace in Liechtenstein some 41 years previously. Ms. Moon decided that she would like to visit that place in order to honor Father Moon’s determination, which is today bearing fruit in the global work of UPF. Later we visited Vaduz and the mountains around Buchs. Our evening event at the Buchser Hof Hotel opened with two young musicians playing pan flute and recorder. Ms. Moon read the Founders Address with deep conviction and warmth. After the presentation of flowers and a gift, she stayed and participated in the World Peace Blessing. 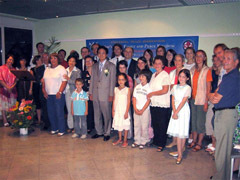 The event ended with a hopeful tone and a determination to bring about a peaceful world, starting with ideal families. The traditional three cheers manifested this determination. The chosen venue for our event was our Swiss Peace Embassy nestled in Belmont-sur-Lausanne. Although the members of our small community were all called on to play significant roles in our main event in Geneva later in the day, the afternoon event turned out to be a very wonderful experience for us all. There were 21 participants, almost half of them guests, and they seemed to sense the profound significance of the day. From the thoughtful opening remarks of Mr. Remy Gindroz, the local UPF representative and coordinator of the preparations, through the heartfelt invocation offered by Ambassador for Peace and neighbor (representing the Church of Jesus Christ of Latter Day Saints) and through to the message of Professor Carl Keller (renowned theologian from the University of Lausanne), who is also a long-standing Peace Ambassador, all seemed to seamlessly prepare the way for our main speakers. Mr. Jonah Gindroz delivered the Chairman’s Address in French in a sure and serious manner. Mr. Shin Bok Hong was introduced as the grandchild of Rev. 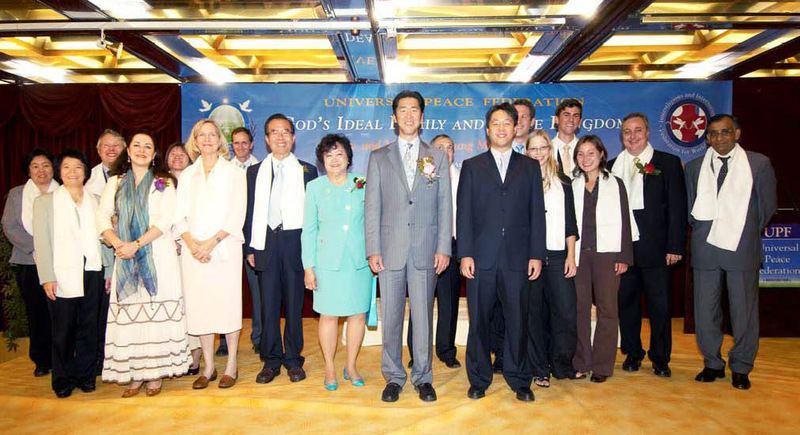 and Mrs. Sun Myung Moon and welcomed as part of the family. He read the Founder’s Address with a conviction and pride that touched everyone in the room, sometimes smiling as he read, as if reading our minds. Mrs. Carolyn Handschin, United Nations representative for UPF and WFWPI, was invited to give further detail about these two organizations, both inspired by the wisdom of Reverend and Mrs. Moon, and to explain the Ambassador for Peace program. At that time four Ambassadors for Peace were nominated, including the director of a drug rehabilitation program, the regional representatives of two different religious communities, and a very dedicated and grandmotherly piano teacher. We closed our official program with a song by Ms. Julia Handschin but continued to deepen our relations as we shared refreshments and prepared to greet Mr. Hyun Jin Moon in Geneva. In the city of Bern, Mr. Shin Il Moon was received in the Allegro Grand Casino Kursaal, next to the famous Bundeshaus, the federal Parliament building in Bern. Around 30 people were gathered there to receive the message of hope and vision for “God’s Ideal Family and the Peace Kingdom.” Three persons were recognized as Ambassadors for Peace. In the beautiful Park Hotel in WINTERTHUR, where former Soviet Union President Gorbachev once resided and the Perestroika bell rang, we were honored to welcome Mr. Hirotaka Otsuka representing Father and Mother Moon. He delivered the Founder’s Address with a determined and strong spirit. We organized a lunch, and a beautiful atmosphere was created with songs, musical performances and flowers; three generations of participants ranged from 8 to 80 years old. Our Winterthur Ambassador for Peace, Mr. Jean Janik, who originally comes from Lebanon and speaks seven languages, offered the opening remarks. He spoke about his own intercultural marriage and how he won the heart of his Swiss parents-in-law. We are really grateful to Father and Mother Moon for sending Mr. Otsuka to Winterthur. This is truly a great blessing for our small city. Guests from several religious communities and friends and family of UPF’s membership in LUCERN gathered this evening to welcome Ms. Shiori Kunotoki, who came to represent the Federation’s Founder and to deliver his Address, which is an encapsulation of his philosophy of peace. Ms. Kunitoki’s sincere heart and warm spirit was completely consistent with the message of true love, ideal family and living for the sake of others exemplified by the Moon family. The conference in Luzern was small but spirited and included contributions from young and old in the spirit of this three-generation World Peace Tour. ARAU’s conference on “Family and a Culture of Peace” took place in the town’s largest Catholic Church. The Catholic community opened the doors wide for our event on the very memorable day of September 11. Invitations were handed out up until the last moment, and the room was full as Mr. Thomas Markus Meier, a Catholic theologian, presented a few opening remarks. He talked about true peace only being realized when someone is willing to pay the price by giving and sharing with the miserable, the poor and the suffering. 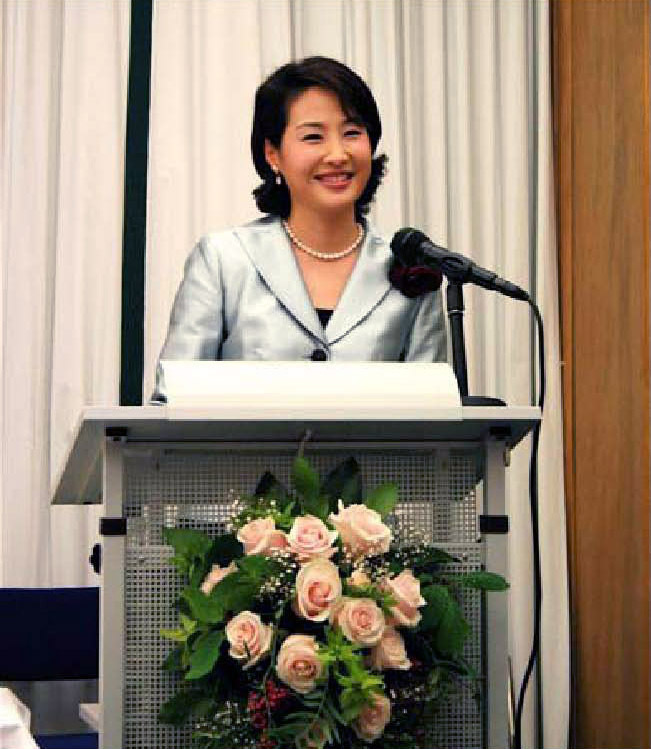 Ms. Jin Hwa Yoshida Moon came on stage to present the keynote speech: ”God’s Ideal Family and Peace Kingdom.” She greeted the audience in such a charming way, giving her message in a lively manner that was well received by everyone. The whole event was like a family celebration in which one could sense that loving families are really the foundation through which a peaceful world becomes possible. LA CHAUX-DE-FONDS is a pioneering place for the work of UPF in French-speaking Switzerland. We rented a hall in the Freemason Lodge. One Somali refugee, now a Swiss citizen and freshly appointed Ambassador for Peace, spoke about his deep quest for peace after having experienced war and about his pride to be part of the Universal Peace Federation founded by Father Moon. These words introduced the Founder’s Address given by Ms. Yeon Sun Yu, granddaughter-in-law of the True Parents. She shared her heart and read the speech with passion, later taking time for pictures with the participants. She also gave certificates to two new Ambassadors for Peace, but most of all she gave hers and her family’s heart of love and service which gave us courage and a new determination to work for the advancement of the Universal Peace Federation.